Today, keyboards are used in different fields. With regard to robustness against influences of weather, environment and mechanical treatment, chemical resistance, easy cleaning and handling (ergonomic and haptic) and way of mounting, they have to accomodate a variety of different requirements. 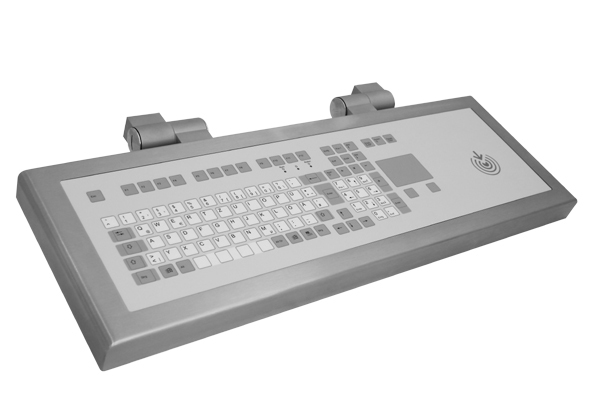 Industrial keyboards are designed for a rugged environment where reliability and robustness are necessary. For the manufacturing of our membrane keyboards, we exclusively use materials of high quality which have proven their worth in pratice and guarantee safety, reliability and a long lifetime. The high chemical resistance of the decor foil is defined according to DIN 42 115. To take account of the importance of the ergonomic comfort, snap domes or short-stroke keys which have proven their worth a million times are used. Together with an embossing of the decor foil, they ensure a tangible tactile switching behaviour. In close cooperation with our customers, we develop and manufacture complete electronic modules with controller. For information on the use of data entered here.